We are a family-run producer of artisan goat cheeses and goat milk confections, happily supplying the Baltimore area's top restaurants that feature fresh local ingredients. Do you know how awesome goats are?? According to legend, an Ethiopian goatherd was grazing his goats on a mountainside. The goats were eating a tall bush with shiny green leaves and red berries. Soon after, the goats started moving actively, as though they were full of energy. Finding this quite interesting, the goatherd decided to try the berries himself. After consuming the berries he reported that he felt awake, uplifted, and full of energy. Charlottetown Farm produces artisan goat cheeses and goat milk confections supplying over 20 top Baltimore-area restaurants. We provide fresh artisan goat milk products and confections to restaurants, consumers, and retailers in the mid-Atlantic region. 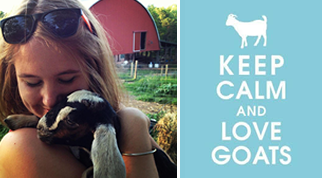 We raise LaMancha, Alpine, and Recorded Grade dairy goats. Our goats are ADGA registered and shown at a variety of dairy goat shows.